Finally was able to make this quilt out of my winnings. I am thrilled how it turned out. It is hanging in a temporary place and and not hanging down all the way smooth. Also still have to do the hand sewing part on the sleeve and binding. I thought you would like to see it though. Very happy. Big THANKS to Sophie for organizing this all and giving us a beautiful pattern to try every month! 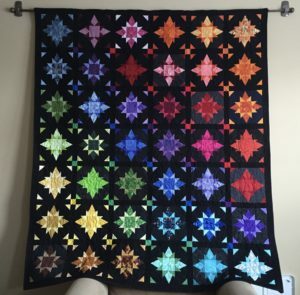 Thank you for sharing your beautiful Twinkle-y quilt. I edited your post to change the category to Show and Tell so that it will be featured at the top of the home page and appear in the Gallery. It’s gorgeous! As the saying goes, Absolutely Fabulous. It looks like a stained glass window. Gorgeous! What a beautiful quilt, you did a marvelous job of color gradation. I love the secondary pattern that happens with your sashing. Thanks for posting. Wow! You did a wonderful job with that one.